I love accurate loudspeakers – but there's a down side. The more you hone them the less characterful and engaging they become. The best compromise I ever came across was made by Tannoy who were able to combine fundamental accuracy with dynamite sonics in a way that eluded all others. A big reason for this gap between mainstream and Tannoy lay in simple and obvious places like unique in-house drive units – their big dual-concentrics – housed in enormous cabinets. I loved every inch of them – a go-to for the visceral excitement we all (secretly!) dream about. The only drawback of course was the price: think £3k to £10k or more if you can manage it – and own a castle big enough to contain their size and strong enough to withstand their power. All of which brings me to the also characterful Klipsch R-820F Reference loudspeakers we review this month on p27. They're big too and have Klipsch's own unique drive units. Big cabinets give great bass. Yet these big boys from the USA cost just £900 and need Watts you can count on your fingers. Klipsch are big in the USA; Quad are big in the UK. 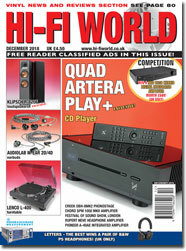 Innovative since 1949 with products that work wonderfully – I've owned them – I was happy to spin CD and listen to music from my iPhone with the new Artera Play+, reviewed on p10. Beautifully built in Quad fashion, and packed with latest technologies including the ES9018 DAC backed up by a linear power supply, this is a complex but intriguing CD player that is far more than that. How do you build a good Direct Drive turntable and sell it for £200? Don't know. The economics baffle me. But Lenco deliver just this in their new L-400 that I review on p82. It is another product that delivers unbelievably good results at an absurdly low price. We like to review the extravagantly expensive and large, such as loudspeakers from Tannoy, But this issue instead brings you affordable products that also make music exciting to hear. 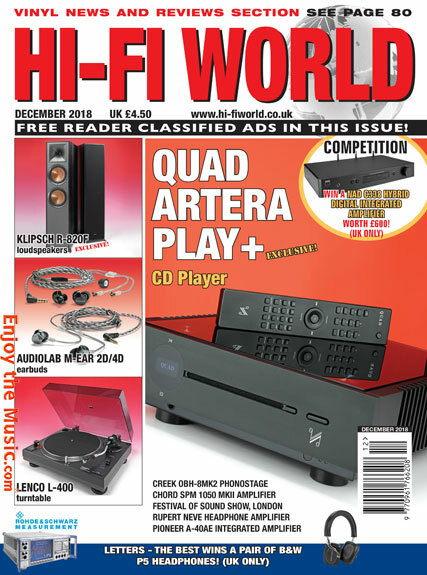 I hope you enjoy December 2018's edition of Hi-Fi World.